An Israeli soldier stands on a tank near the border with Syria in the Israeli-occupied Golan Heights, May 9. An international bloc consisting of the U.S., Israel and the Gulf countries except Qatar, under the leadership of Saudi Arabia, has initiated a campaign against Iran proposing that Tehran's nuclear arms are posing danger. Accordingly, the U.S. has declared that it had pulled itself out the so-called nuclear deal made with Iran during the era of former U.S. President Barack Obama. The Gulf's complaints about the alleged Iranian presence in Yemen through the Shiite Houthi militias have turned into an arming race as many Gulf countries have bought billions of dollars' worth of weapons from the U.S. Among the participants of this unnamed bloc Israel is at the forefront, challenging Iran's expansionist policies in Syria and has been carrying out military operations toward Iranian bases within the country. Russia's stance was a matter of curiosity for many as it is the main backer of the Syrian regime and Bashar Assad. Last month, Russian Foreign Minister Sergei Lavrov said only Syrian troops needed to be near Israeli territories, implying that Iranian militias had to stay away. "It should only be the armed forces of the Syrian Arab Republic that stand on the Syrian border with Israel," he said, adding that, "Of course, the withdrawal of all non-Syrian forces must be carried out on a reciprocal basis; however, it must be a two-way street." However, Russia was not totally happy with the situation as it had challenged the U.S.-led military operation on regime bases the month before. Following these attacks Israel had claimed that it was under direct threat, posed by Iran. Israeli TV channel, Channel 2, last month, reported that there was a hidden agreement between Israel and Russia, aiming to curb Iran's power in Syria. According to the understanding, Russia had assumed the responsibility of keeping Iranian and Hezbollah forces away from Syria's border with Israel on the occupied Golan Heights. In return, the report said that Israel would not carry out any operation and not intervene when regime forces are deployed near the southern border. A recent development indicated that Russia was intending to eliminate Iranian presence in Syria, especially near the territories, occupied by Israel. 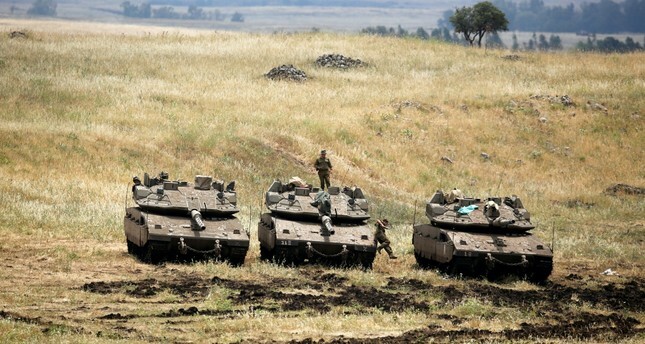 It was reported that Russia started deploying its troops near the Golan Heights, which are under Israeli occupation and Israel's pretexts for attacking Iranian bases. Despite the fact that Lebanon-based Shiite militia group Hezbollah is dominantly active in that area, Russia has started expanding the size of the areas, controlled by its military. Iran's Brig. Gen. Masoud Jazayeri told Lebanon's al-Manar, "Iran and Syria enjoy deep relations that would not be influenced by the propaganda measures of anyone," adding that the Lebanese militias would not leave Syria. Russia may not desire to see a rival power in Syria in its own side in order to maintain the position of the regime's main backer. In this way Moscow becomes the only voice of Damascus. However, it is unclear whether Iran will be as submissive as Russia desires for decreasing the level of its presence in Syria, in which it has been fighting almost since the war broke out.